When you are in Porto it is highly likely that you will sample some finest Port at least once. Either with a meal or on its own, or perhaps you will make a trip to one or Porto’s famous Port cellars for a professional Port tasting. This was at the top of my to-do list for my recent trip to Porto. I would recommend booking a tasting for the afternoon, perhaps after lunch. From the city centre, make your way down Avenida Vimara Peres towards the river, this will bring you out at the upper crossing of the Luiz I Bridge. Take your time crossing the bridge as there are some absolutely breath-taking views to be had over Porto and along the River Douro, not only from the bridge but also from the Jardim do Morro, located at the far end of the bridge. When you arrive here, you will find the cable car which will take you down the hill to the water’s edge. A one-way ticket costs €5, and includes one free tasting at the Quevedo cellars. A 6 minute descent takes you right into the heart of the Gaia district of the city. On arrival I made my way to Quevedo to sample my first glass of Port for the day. After a short walk I arrived at the cellars and entered a dark, rustic style building. Following signs for the Port tasting, I made my way upstairs into an equally rustic, but much brighter and airier room. At one end of the room was a long bar, laden with more bottles of Port than I have ever seen, and the rest of the room was laid out in small seating areas, from comfy sofas to stools, set out around tables which were made from old Port barrels. The perimeter of the room was adorned with literature, and images of the processes involved in making all varieties of Port, from growing the grapes to opening a bottle and enjoying it. It makes an interesting read as you are enjoying a glass, or two! For my first tasting I started with their Tawny Port, as this is my favourite type of Port. After enjoying my first glass in the cosy, warm atmosphere I decided to stay here for a while and sample some more of the Port that they had to offer. All of their Ports can be sampled here, and their prices start at just €2 per glass. I ordered a white, and a rosé to try next, and I also ordered a snack of Portuguese sardines. Both of these types of Port were very different, and although neither would be my first choice, they were very enjoyable. The white and the rosé could easily be enjoyed chilled, and mixed with lemonade as a refreshing drink on a warm summer’s day. I finished with a glass of their 1996 and another of 2000 Colheita. A Colheita is a Tawny Port made from a single vintage and is aged in Oak barrels for 20 years or more, unlike vintage Port which can be bottled as soon as 18 months after harvest, and is then aged in the bottle. The 1996 Colheita was by far my favourite of the day so far, and of course I had to purchase a bottle to take home with me. After my visit to Quevedo, I made my way up the hill towards Taylor’s, a brand you have probably all heard of before. 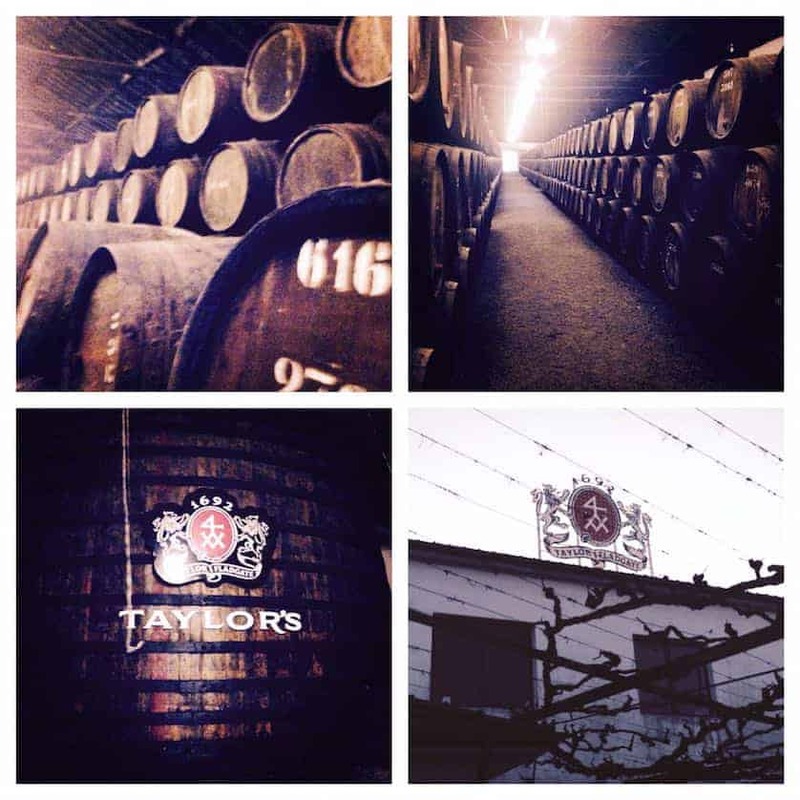 For €5 per person, Taylor’s offer a tasting session with a tour of their facility. This is excellent Value. I signed up for the tour and tastings and had a 15 minute wait until the tour started, so to pass the time I had a look at all the artefacts displayed in and around the bar area. The tour began in their storage cellars, and they gave us a background to the history of the company. From the outside, the building didn’t look very big at all, but when I walked through the doors into the main storage room I was overwhelmed, as the room seemed to go on forever, and was stocked high towards the ceiling with barrels of Port, as far as the eye could see. You could tell that the building, and also the barrels were old, as you could smell the strong musty scent. The guide explained to us how you can tell which type of Port and what quantity is in each barrel by the markings printed on the end. He also told us that no two barrels are the same, and that they can range from 500 to almost 700 litres per barrel. When the tour reached the far end of the storage room we saw one solitary barrel, so big that it contained over 100,000 litres of Port. We were told that at the moment this was filled with white Port, and the size of the barrel means that there is less contact between the barrel and the Port inside, resulting in the oak having less of an influence on the taste of the Port. Once the tour had come to an end we were led back into the tasting room and each handed glasses of white, ruby and tawny Port to taste. We were given a short explanation of each and then invited into a small room, just off from the main tasting area, to watch a video about Port and its production. We all watched this at our leisure whilst enjoying the varieties of Port. Taylor’s have a small shop on the way out, and a stop here was impossible to resist. After spending all afternoon in these two cellars, the day had flown by and I had run out of time to visit any more. However I would highly recommend both of the cellars that I visited, so if you are in Porto, and like Port, then they are definitely worth a visit! Perfect Summer, The Best Moments in Pictures!